1973-03-09. New. Ships with Tracking Number! INTERNATIONAL WORLDWIDE Shipping available. Buy with confidence, excellent customer service! 1973-03-09. Good. Ships with Tracking Number! INTERNATIONAL WORLDWIDE Shipping available. May not contain Access Codes or Supplements. May be ex-library. Shipping & Handling by region. Buy with confidence, excellent customer service! Morrow. Hardcover. 0688002021 New Condition. . New. New York: Morrow, 1973. First Printing. good, fair. 22 cm, 346, illus., index, some edge soiling, DJ soiled and some edge wear. Scholar and author Lewis' scarce second book, an account of the Dreyfus Affair in France, in which a Jewish military officer was unjustly accused of treason. New York: William Morrow & Company. 1973. First Edition; First Printing. Hardcover. 0688002021 . Very Good+ in boards. ; 8.30 X 5.70 X 1.40 inches; 346 pages; All domestic orders shipped protected in a Box. .
Morrow. Hardcover. 0688002021 Like New Condition. . Fine. Morrow, 1973. 1st. Hardcover. A VERY FINE crisp copy iin a near FINE bright dj. NY: Morrow, 1973 VG/VG. out of print. first edition. Binding is cloth..
New York, New York, U.S.A.: William Morrow & Company, Inc., 1973. Very good hard cover with very good dust jacket. Jacket has some edge wear, small tear on back. Black-and-white photos and illustrations.. Hard Cover. Very Good/Very Good. New York: William Morrow and Co., 1975. 346 pages indexed with bibliography. Tan boards with dark blue cloth quarter spine and gold lettering. Blue pictorial dust jacket has some shelf scuffs, minor creases and edge wear, and 8.95 price is unclipped. Attractive bright blue endpapers. An examination of the Dreyfus Affair---the story of Alfred Dreyfus, the French Army's most promising Jewish officer who was falsely accused of passing military secrets to Germany. How high goverment officials framed Dreyfus as a traitor to enhance their own political ambitions and in doing so raised anit-Semitism to a national passion. They then claimed 'national security' as their reason for covering up the crime they had committed-fearing such revelation would cause the governments downfall. It ended as the cause celebre of the nineteenth century, the Affair not only of France but of the world, an event that eventually was to cause mass protests in Europe and America and produce Emile Zola's ringing J'Accuse and involve such famous figures as Mark Twain, William James and Queen Victoria. Forty five black and white photographs. Contents in Fifteen Chapters. Preface, Chronology, and Selected Sources. A stunning re-creation of a terrible act of injustice that has an eerie contemporary ring. . Hard Back. Near Fine/Good. 5 1/2" x 8 1/2". New York: Morrow, 1973, 1973. Hard Cover. Very Good/Very Good. Top edges are slightly foxed; dust jacket is price-clipped and slightly yellowed. First Edition. Hard Cover. Very Good/Very Good. 8vo - over 7¾" - 9¾" tall. hardcover. Illus. 8vo, cloth, d.w.; (d.w. lightly soiled and taped). N.Y.: Morrow, 1973. William Morrow and Company, Inc. New York: 1973. Hardcover with dustjacket. Good condition. Dustjacket is worn and torn. ISBN: 0688002021. Morrow, 1973-01-01. Hardcover. Used: Very Good/Used: Very Good. Mylar cover. Penciled notes from prior seller on FFEP. NY: William Morrow. Good+ with no dust jacket. 1973. First Edition. Hardcover. 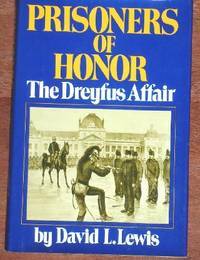 Prisoners of Honor - The Dreyfus Affair. Henry Holt, N.Y. 1994. Pb. Vg. Morrow. Used - Good. Former Library book. Shows some signs of wear, and may have some markings on the inside. New York: William Morrow & Company,Inc, 1973. HC. good w/good dustjacket (hardcover). 45 B&W ill.. ISBN 0688002021 The Affair began with the persecution of one man, Alfred Dreyfus, the French Army's most promising Jewish officer, who was falsely accused of passing military secrets to Germany. It ended as the cause celebre of the nineteenth century, the Affair not only of France but of the world, an event that eventually was to cause mass protests in Europe and America and produce Emile Zola's ringing J'Accuse and involve such famous figures as Mark Twain, William James and Queen Victoria. 346pp. Morrow, January 1973. Hardcover. Acceptable. HarperCollins Publishers, 1973. Hardcover. Good. Disclaimer:A copy that has been read, but remains in clean condition. All pages are intact, and the cover is intact. The spine may show signs of wear. Pages can include limited notes and highlighting, and the copy can include previous owner inscriptions. Morrow. Used - Good. Good condition. Good dust jacket. Writing inside. Slightly dampstained. Morrow. Used - Acceptable. Acceptable condition. Good dust jacket. Morrow, 01/01/1973. First Edition. Hardcover. Used; Good. **WE SHIP WITHIN 24 HRS FROM LONDON, UK, 98% OF OUR ORDERS ARE RECEIVED WITHIN 7-10 DAYS. We believe you will be completely satisfied with our quick and reliable service. All orders are dispatched as swiftly as possible! Buy with confidence! NY: Morrow. 1st. 1973. good+. Hardcover. ISBN:0688002021 gold-colored paper over boards is a bit soiled; black linen backstrip with fading gilt lettering; 346pp + 22pp b/w ils; light stains on edges; prev. owner's name on half title page . Morrow. Very Good in Good dust jacket. 1973. First Edition. Hardcover. 0688002021 . HarperCollins Publishers, 1973. Hardcover. Acceptable. Disclaimer:A readable copy. All pages are intact, and the cover is intact. Pages can include considerable notes-in pen or highlighter-but the notes cannot obscure the text. At ThriftBooks, our motto is: Read More, Spend Less.Dust jacket quality is not guaranteed. HarperCollins Publishers, 1973. Hardcover. Very Good. Disclaimer:A copy that has been read, but remains in excellent condition. Pages are intact and are not marred by notes or highlighting, but may contain a neat previous owner name. The spine remains undamaged. An ex-library book and may have standard library stamps and/or stickers. At ThriftBooks, our motto is: Read More, Spend Less.Dust jacket quality is not guaranteed. Morrow. Hardcover. 0688002021 Book is very clean. Crisp pages. Tight binding. Different cover than shown. Light shelf wear on dust jacket. Light tanning. Dented corners. . Very Good. Morrow. Used - Good. Good condition. Good dust jacket. Slightly dampstained. Morrow. Used - Good. Good condition. Good dust jacket. Writing inside. Morrow. Hardcover. POOR. Noticeably used book. Heavy wear to cover. Pages contain marginal notes, underlining, and or highlighting. Possible ex library copy, with all the markings/stickers of that library. Accessories such as CD, codes, toys, and dust jackets may not be included.